Are bed bugs bugging you at night? Are you out of ideas on how to get rid of them? Look no further. When you need prompt and efficient bed bug extermination in your home, it’s best to call the professionals, and that’s where we come in. Backed by more than 10 years of experience, our qualified technicians can eradicate the pests that are plaguing your household. If you suspect you need bed bug control in your home due to painful and itchy bites or suspicious droppings on your furniture, we'll be there. We thoroughly inspect every crack and crevice in your home and then provide a comprehensive extermination strategy catered to your property’s unique needs. At our pest control company, we focus on delivering unparalleled customer satisfaction by implementing our first-rate bed bug treatment processes until the problem is resolved. Our company is licensed, bonded, insured, and consistently up to date on all bed bug infestation removal technology and techniques. In order to better serve our clients, we recently obtained a new Patriot 2XP Green Bed Bug Killing Machine. As one of the few companies in the area to own and utilize this machine, we have achieved a greater success rate than our competitors. Because we always strive for 100% customer satisfaction, we employ a bilingual bed bug control staff to offer services in both English and Spanish. We want to make sure you can tell us exactly where you find these pests, so we can start the process right away. We’re happy to answer all of your questions and set up an appointment that works for your schedule. After your free inspection, we offer a one-hour pest control service with no contract required. The Question Is: What Are Bed Bugs? Bed bugs are six-legged, blood sucking parasites that feed off of humans, birds, and mammals. They are most active in the winter, but can be a problem all year long, invading even the cleanest of buildings. Identifying them is the first step to getting rid of them. Keep in mind that they resemble many other bugs, and it’s critical to ensure that we treat for the right kind, as the extermination process is different for each bug. The adults are five to seven mm long and brown with oval-shaped bodies. If they have eaten recently, they may appear more reddish-brown and elongated. They also have antennae, wings that aren’t used to fly, and produce a musty odor. Young bed bugs are smaller and more whitish-yellow in color, and can be nearly invisible if they haven’t eaten in a while. The eggs are white, about the size of a pinhead, and will have an eye spot if they are more than five days old. Females lay hundreds of eggs over their lifetime, and if conditions are favorable, young bugs may reach full development in just one month. Having pests in your home is not only annoying, it’s also potentially harmful. Bed bugs bite when you’re asleep, and can leave itchy red welts that irritate your skin. Be aware that other insects can leave bites that strongly resemble theirs, so a bite alone is not a good indication of a bed bug infestation. The sure way to know if you have a bed bug problem is to find and positively identify a living specimen, but don’t hesitate to call us if you see any of the following signs of bed bugs. How to Get Rid of Bed Bugs: Let Us Help! We provide bed bug treatment all year round that incorporates proven removal methods with state-of-the-art equipment and products. Bed bugs are not easy to eliminate once they invade your home, but we have the tools and training to handle it. Trust us to treat your property when you first see them or notice their signs, so you can sleep tight without a bed bug bite. Our skilled and experienced technicians maintain a safe indoor and outdoor space while exterminating, so you won’t have to worry about putting your kids or pets at risk from chemical agents. Rest assured, our techniques not only get rid of pests, but they also prevent them from returning. Rely on our crew when you are wondering how to get rid of bed bugs once and for all! You shouldn’t have to pay a high price for a pest-free life. Our wildlife treatment plans and removal solutions are customized for your needs and budget. 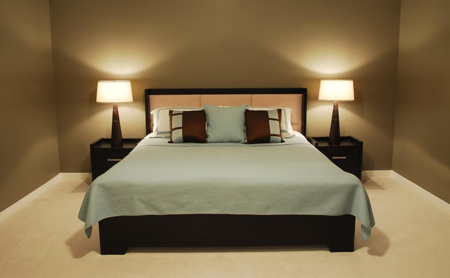 You’ve worked hard to create a beautiful home; don’t let pests make you afraid to sleep in your own bed. We respect your space and always leave it the way we found it, minus the pests. Most importantly, don’t wait for a pest problem to get worse. These critters breed fast, so what may seem like a minor issue can quickly become a major infestation as the bugs multiply and spread out over your property. Even one little bug can leave multiple bites or lay hundreds of eggs. By calling us right away, you can stop the problem where it starts. Let us help you make a positive impression by keeping a pest-free property. If we find one or more colonies during an inspection, we'll ask you to complete a few steps for us in order to prepare for the most effective bed bug treatment. Before we begin exterminating, we ask you to wash all of your bedding in hot water and remove any infested items in sealed garbage bags. Our specialists identify any additional belongings or clutter that may be infested and need to be discarded. Contact us for professional bed bug inspections. We eradicate bed bugs throughout Miami Beach, Fort Lauderdale, Homestead, Kendall, Coral Gables, and Key Biscayne, Florida, plus all of the surrounding communities.